I'm afraid work and real life have invaded hobby time again over the past couple of weeks, so apologies for falling behind with regular posts. 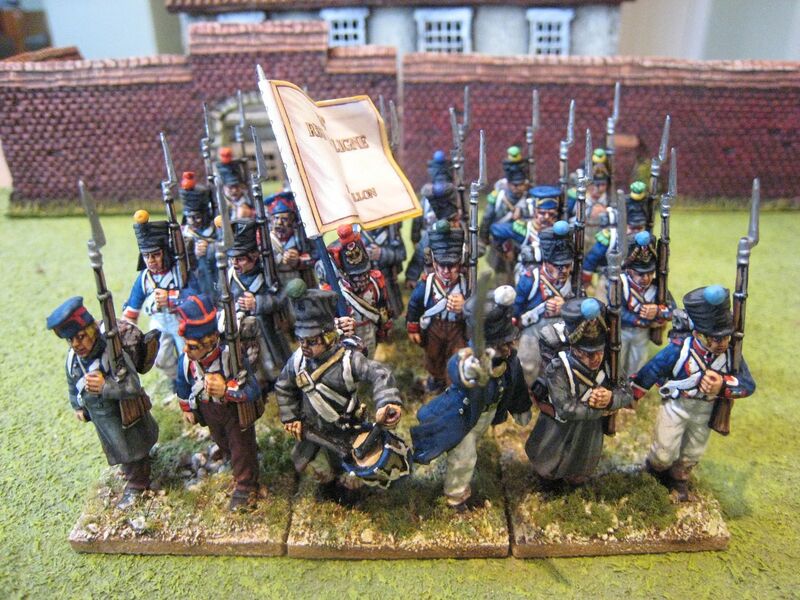 Here is something that I started painting back in January 2012 and then added to from time to time until I decided to finish it off in February 2013: more Perry French infantry for Waterloo. After finishing off Bachelu's division, I looked around to see what division to work on next. I settled on Quiot's division in d'Erlon's I Corps, so I'm basically working my way east across the battlefield, having started with the division at the end of Jerome's Corps. So the focal point for my Waterloo project at the moment is the area between Hougoumont and La Haye Sainte. These are all plastic figures apart from the 3 command figures. This is the second battlion of the 54th Line, part of the 1st brigade of the 1st division of I Corps. I painted the brigade commander, Colonel Charlet, last year. 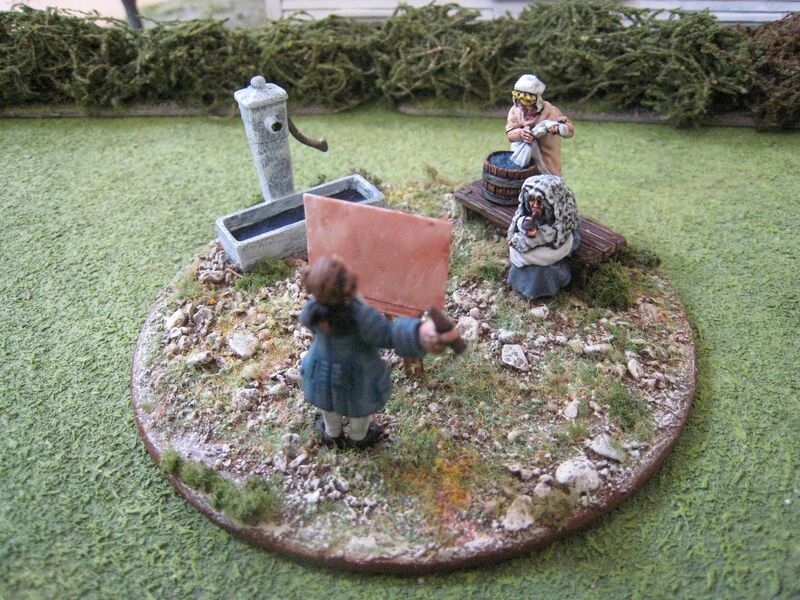 At 1:20 for the "General de Brigade" orbat, this battalion has 24 figures. As I worked through Bachelu's division I decided to standardise the shako covers and greatcoats in each battalion. I've now decided to use the colours of the shako covers to differentiate between divisions. 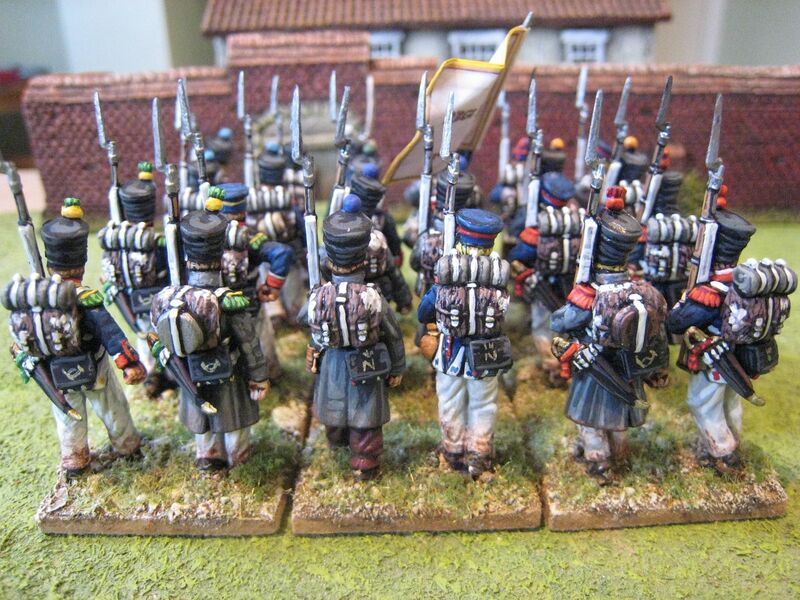 So while Bachelu's troops have canvas-coloured covers, Charlet's troops will have black oilskin ones. 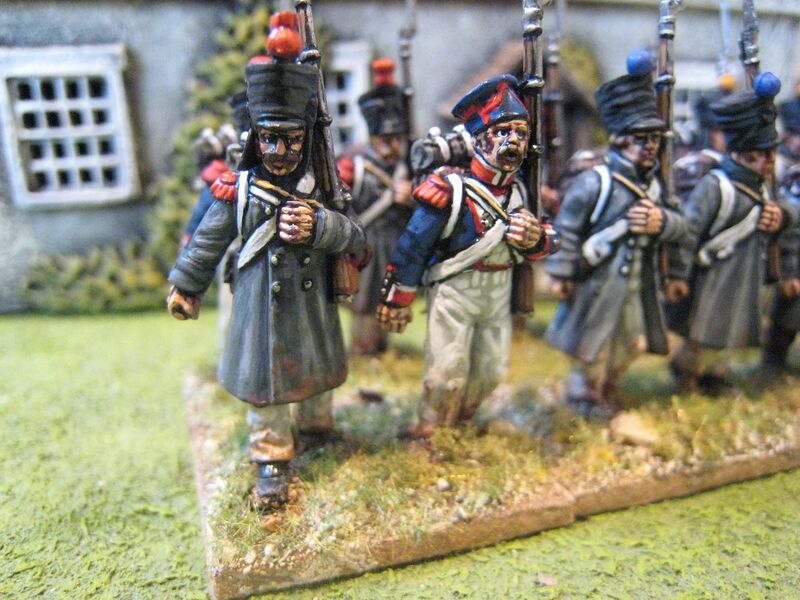 A couple of the grenadiers have "fusilier" heads with extra moustaches that I sculpted with green stuff. I cut off the right arm of one of the voltiguers and glued on the arm from the skirmishing figures to suggest he'd trying to adjust his straps (or something like that). I forgot to include the additional skirmishing voltiguer bases in the photos, but they do exist. 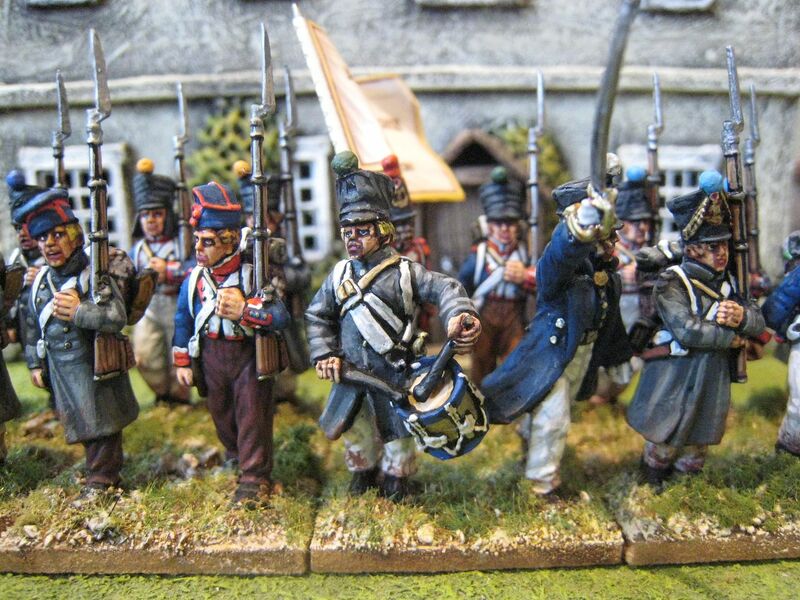 You can also see from the photo above that I forgot I was painted grenadiers at one point, because the chap on the left of the grenadier base has a voltiguer horn on his cartridge box! 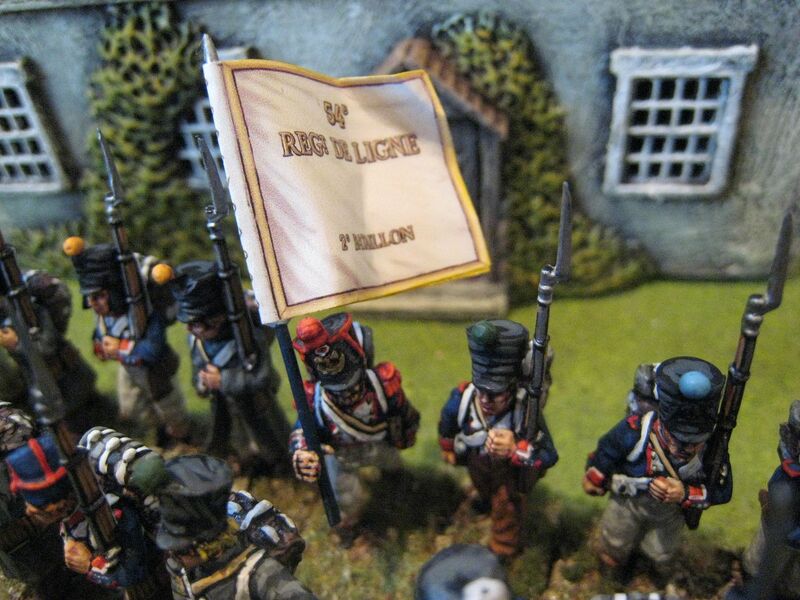 The 54th is one of the French regiments for which GMB do special battalion flags. The building in the background is by Touching History, and the walls are (I believe) from the Hovels Hougoumont sets (painted by Touching History). As I said above, my painting time has really take a body blow since little Monty was born. It's not so much having to deal with 2 boys rather than 1, but rather the fact that Hugo now doesn't have his afternoon nap - this means I no longer have a good 2 hours each weekend day (and bank holidays) and so painting is limited to about 45 minutes in the evening, if I get home from work before 8pm (increasingly rare these days). Luckily I'm still working through my backlog of finished units from earlier this year. 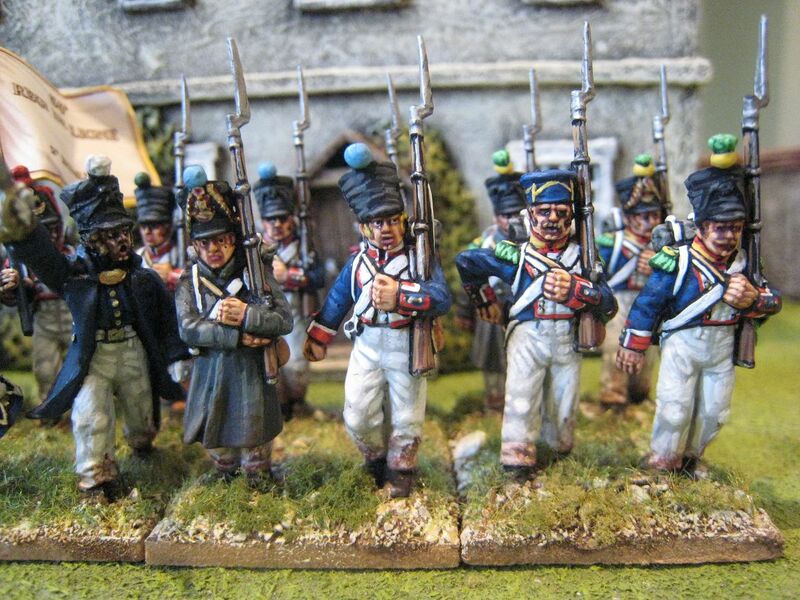 I'll have some 1815 Hanoverian riflemen at the end of the week. 24 figures (plus 4 skirmishers). Painted at various times from January 2012 to February 2013. Flag by GMB. As I find is often the case with "tricky" bits of modelling, the "difficult" bits didn't actually take long to finish. I painted the water trough with the Foundry "Stone" palette, and then gave it a final drybrush with an off-white (I forget which paint exactly, but it would have been a Coat d'Arms light grey). The easel I scratch-made from bits of matchsticks. I spent a bit of time searching the internet for pictures of mid/late 18th century easels to see what they would look like - not many seem to have survived, but there are quite a few paintings from the period which are themselves pictures of painting scenes. 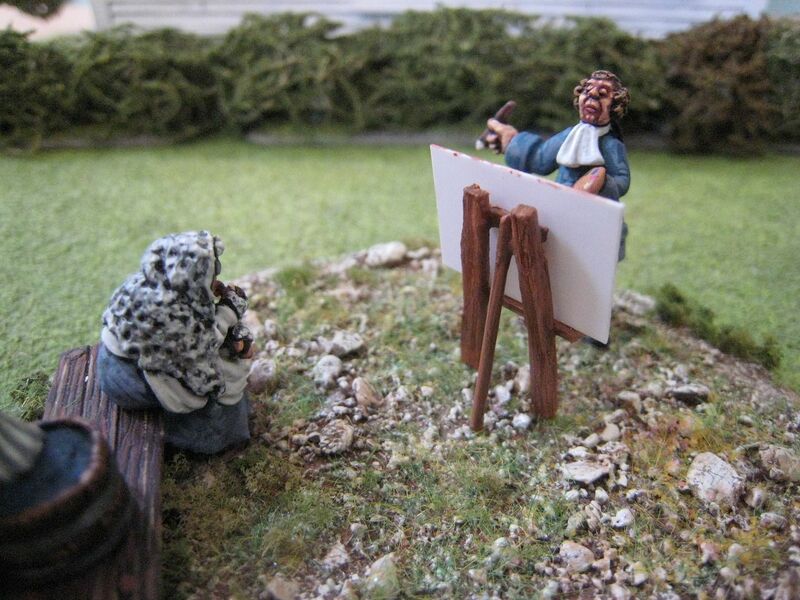 That said, easel design doesn't seem to have advanced all that much over the past 300 years. It probably the case, however, that the type of easel I made isn't the sort of thing that a painter would have taken out of the studio. Also, the painter in this scene is probably an amateur, as most established artists in the 1770s would have been concentrating on grand historical scenes or society portraits and wouldn't have wasted their time painted the local rustics. Anyway, the easel was a bit fiddly to do in the end, the hardest part being to carve out the ridge in which the painting sits. 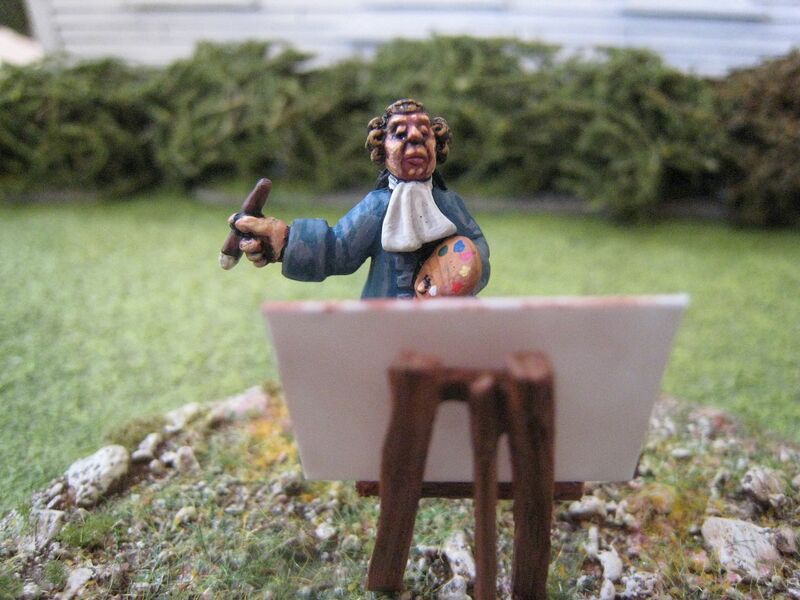 Once it was all glued together, I painted the easel with the Foundry "Chestnut" palette. 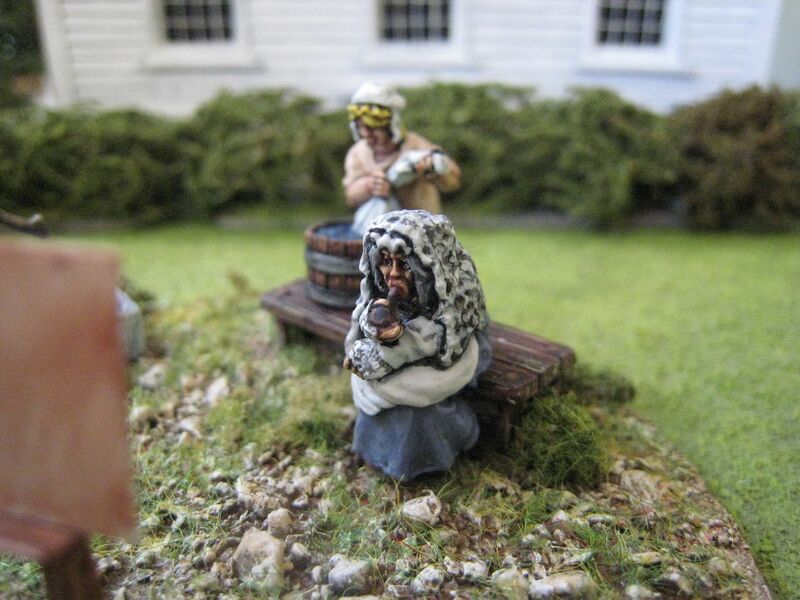 Looking at these photos now, I realise that I should have added some gloss varnish to the water in the tough and the washer-woman's basket. I arranged the figures in what seemed to me to be the most satisfying way, although I appreciate that it's not clear exactly what it is that the chap is painting. The picture itself is simply a bit of Gale Force 9 plasticard. I did think about trying to paint the scene into it, but discarded that idea after about 5 seconds. Rather than leave the "canvas" completely blank, I painted a "red ground" on it. Apparently red grounds are often used by landscape painters to prepare their canvases; I read that Constable favoured a sort of mid-brown colour and I tried to replicate that here. Making the scene look as if the artist is just about to start also meant I could put paints in the palette without smearing them around. I haven't glued the painting to the easel - so I could in theory have a go at painting something in the future. 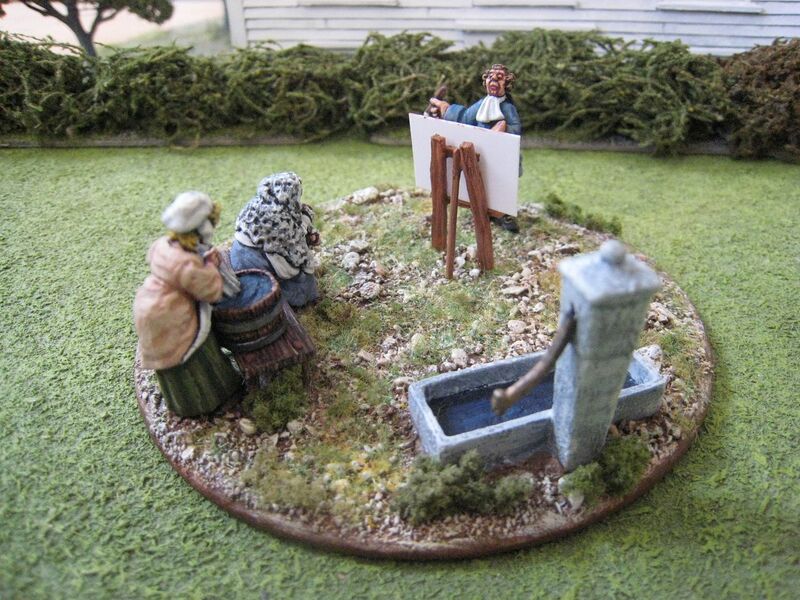 4 figures, a water-trough and an easel. Painted July 2011-April 2013. To keep the AWI ball rolling, this is a unit I painted ages ago but only finished off the other day (i.e. by painting the flag). This is a unit of American militia cavalry that is designed to incorporate various smaller legions and regiments which joined together. The "British Grenadier" scenario for Eutaw Springs, for example, has a unit of 8 figures in respect of "South Carolina State Horse", while the Savannah scenario has a unit of 6 - this regiment is supposed to represent this sort of thing. 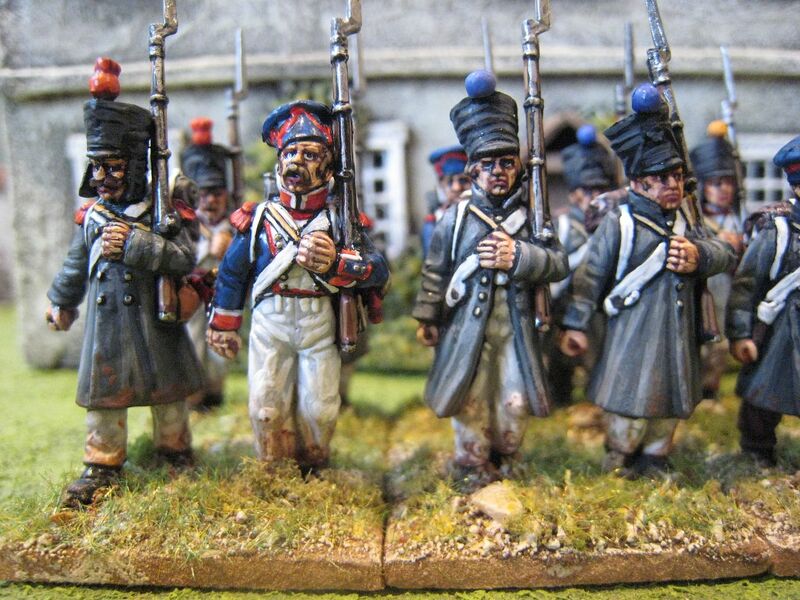 The figures are, of course, from the Eureka Miniatures "ragged Continental dragoons" range, so the figures come with separate hats which allows you to mix and match. Creating this sort of irregular look is exactly what the Eureka range is all about. The uniforms followed plate 12 of Uniformology's Book 26 on Continental Light Dragoons. From left to right, the figures in uniform coats are: Maham's Regiment (blue faced white), Myddleton's Regiment (trumpeter), Hammond's Legion (blue faced red) and Horry's Regiment (white faced blue). All of those units contributed troops to the South Carolina militia. The flag is hand-painted and is simply a generic South Carolina flag. GMB do one just like this, but it's too big for cavalry. The size of this flag (which some may think is still too big) is the same size as Adolfo Ramos' AWI cavalry flags. 8 figures. Painted September/October 2012.